IR Blaster or Infrared Blaster is a unique feature in some of the latest smartphones that makes your phone a Universal Remote, and by using it you can control TV, DVD player, AC or any other device that can be operated by an infrared remote. I have previously written articles on IR Blaster and explained it in detail. Also I have listed which Android devices are equipped with this feature. You can read that article by going to the link given below. Infrared Blaster is a hardware feature but it does require an app or software for its working. Almost all the IR Blaster phones comes with their inbuilt IR Blaster App but sometimes it may not be good enough for you and lacks various devices and features. For this you can use other third party IR Blaster Universal Remote Apps which you can find on Google Play. So here I am going to list some of the best Universal Remote Infrared Blaster Android Apps for your Smartphone. Here are the best IR universal remote apps or Quick Remote Apps for infrared blaster android phones and tablets. Galaxy Universal Remote is a great app that converts your infrared blaster phone into a universal remote. 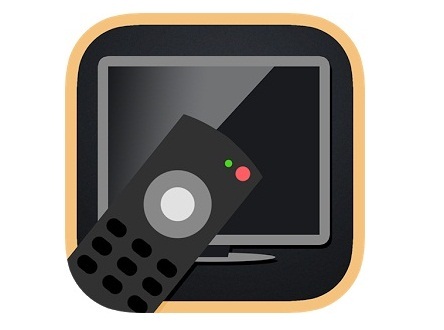 By using this app you can control your TV, your Set-top Box, Audio Video Receiver, Sound System, Amplifier, DVD Player, Blu-ray Player, Media or Streaming Player, Air Conditioner, Projector, DSLR camera, PS3, Xbox and much more. You can add your custom IR code for a device that is not supported by this app. Also you can define your custom universal remote in this app. This app is not free and you have to pay a minimal amount to download this app on your android phone or tablet. It has got average rating of 4.3 (out of 5) on Google play. 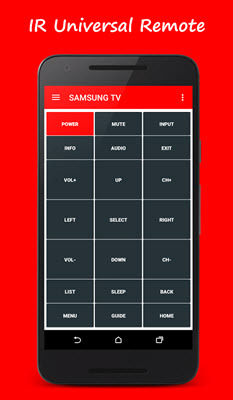 Another good app that makes your android smartphone to function as a universal remote. 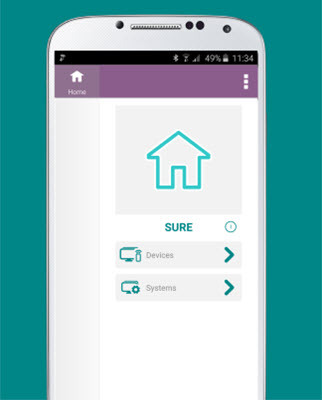 By using SURE Universal Remote app you can control your TV, Smart TV, Cable and Set-Top Box, AC, Streamer- Roku, Apple TV and Chromecast, AV Receiver, DVD player, Projector, iRobot and LED Lights. 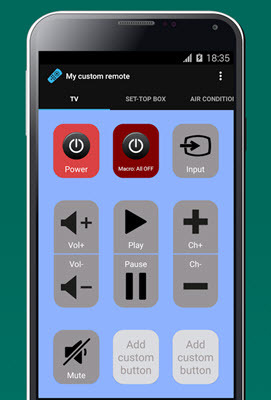 This app also allows you to setup your custom remote. It also supports Wi-Fi for controlling your Smart TV from LG and Samsung. This is also a paid app and you have to pay a small onetime fee for download and usage. This universal remote app has got average rating of 4.4 on Google Play store. Peel Smart Remote (formerly Smart Remote) is also a very good universal remote android app for infrared blaster phones. 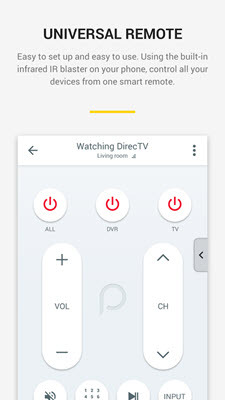 Using Peel Smart Remote you can control your TV, set-top box, DVD player, Blu-ray player, Roku, Apple TV, audio system, home appliances like air conditioners and heaters. This universal remote app has got an average rating of 4.4 on Google Play. IR Universal Remote is a free universal remote app for controlling your infrared devices using your infrared enabled smartphone. It is not as good as the above mentioned paid apps and also it supports limited number of IR phones. Using IR Universal Remote you can control your infrared enabled devices that include TVs, Cable Boxes, Satellite Boxes, Sound Bars, DVD players, Game consoles. There is also a paid version of this app in which you can get all the annoying ads removed. This app has got an average rating of 3.8 on Google Play.